PRIZE DETAILS: First Prize: $500; Second Prize: $300. Prize winning images and Honorable Mention will be published in the book Best Shots. 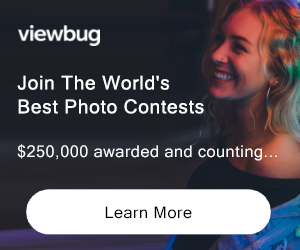 ELIGIBILITY: Photographers worldwide Not eligible to enter? - Find contest where you are. COPYRIGHT: WPGA recognises that the authors retain full ownership of the image copyright USAGE RIGHTS: Participants warrant that their photographs may be reproduced for the purpose of marketing and promoting WPGA contests, in catalogues, posters, postcards, publications, and on the Internet. Such use is granted for not more than two years after the announcement of the awards, and without payment to the photographer or featured models. Photographers will receive photo credits with each use, and will allow WPGA to sub-license their photographs to the press for reproduction in connection with the contest and WPGA exhibitions.